A waterfowler’s season is never over, even when the trusty, weatherbeaten old shotgun is cleaned and racked and the bags of decoys and other paraphernalia of the trade are stowed in the barn for winter. During a stout outbreak of the polar vortex in late January, I happened to be outside at dusk on a sharp, crystal-clear evening. I habitually watch the deep pastel afterglow and sniff the air for “weather.” And content myself with pleasant daydreams. It is good therapy for cabin fever. Suddenly, maybe a thousand feet up, my eyes caught rapid movement streaking southbound. Ducks! About 30 or 35 of them, screaming past silently on a 25 to 30 mph norther of a tailwind. The flock, strung out almost abreast in a wide flowing line, must have been doing 70 mph or more. They were little guys, and struck me as being teal-size. But no way would teal, fair-weather fowl for sure, be hanging around in the depths of winter, what with marshes and streams and bays frozen as hard as concrete. They were slender, fast, with very streamlined, sharp profiles. I started puzzling about what they might have been, their transit through my line of vision having taken mere seconds. While I scratched my head, I thought to contact my friend Mark Shieldcastle, a retired veteran state waterfowl biologist. The more I puzzled, the more I tended to think they were buffleheads, or butterballs as old-time duck hunters used to call them. Or maybe scaup. I might have heard some whistling of wings from goldeneyes, which are slightly larger than scaup or bufflehead. Finally, I also consulted the classic “Ducks at a Distance” booklet, compiled by the late Bob Hines, formerly of my hometown of Fremont, Ohio, for the U.S. Fish & Wildlife Service. 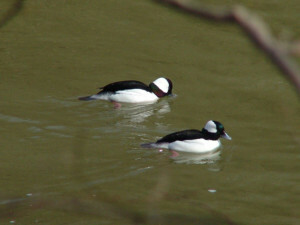 A footnote in Hines’ description of bufflehead states that they prefer to stray as far north as possible as late as possible. That iced my decision. “My birds” were buffleheads. I suspect perhaps no one else even noticed their swift passage in the fading light. So I owned the vision. Butterballs, our smallest duck, are my favorite. My first duck bagged, many seasons ago, was a butterball, though I have killed just a handful. Now, a senior fowler, I let them pass and smile. At the rate the flock was scooting out on that strong norther, they could easily have made the Ohio River and further that night, looking for open water less turbulent than gale-beaten Lake Erie, where they might have been rafting till the weather went, well, south.